I know Talking Angel is so cute that's why my 4 yo daughter loves singing its theme song as much as playing with the application. Today, I asked her to sing 'That's Falling in Love'. It's not her best yet. She needs to memorize the lyrics and also master the tune first, but I am sharing it anyway. 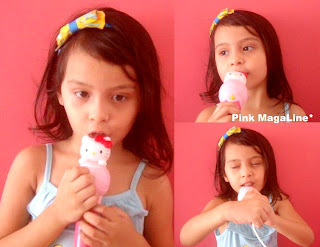 My singing sensation, recorded at her pink room just this morning. Funny eh? I finally have a copy of the lyrics so I guess I'll teach her the correct lines. We'll make another video when she's done mastering it. Oh, I wish we have something like protools 10 at home. I heard pro tools can turn music recording into professional level. In any case, below is the lyrics of the song that my daughter is trying to sing in the video. Thank you! She is 4 years old. Will edit my post for that. Hihi. Your daughter is really cute and smart. She was so lively with the singing too. I'm sure she'll be coming up with more videos in the future. Awwwww! OMG. This made my morning so much better! Askim is a star! Thanks sis. Hihi. She's our entertainer at home.